Dominick “Dic” Loscalzo was born in New York, New York, on March 5, 1896, as recorded on his World War I draft card. In the 1900 U.S. Federal Census, Loscalzo was the third of four children born to Leonardo, a peddler, and Theresa, both Italian emigrants. They resided in Manhattan, New York City at 333 East 11th Street, which was their address in the 1910 census. Shortly after the 1910 census they moved to Brooklyn. By the mid-1910s, Loscalzo was a cartoonist. 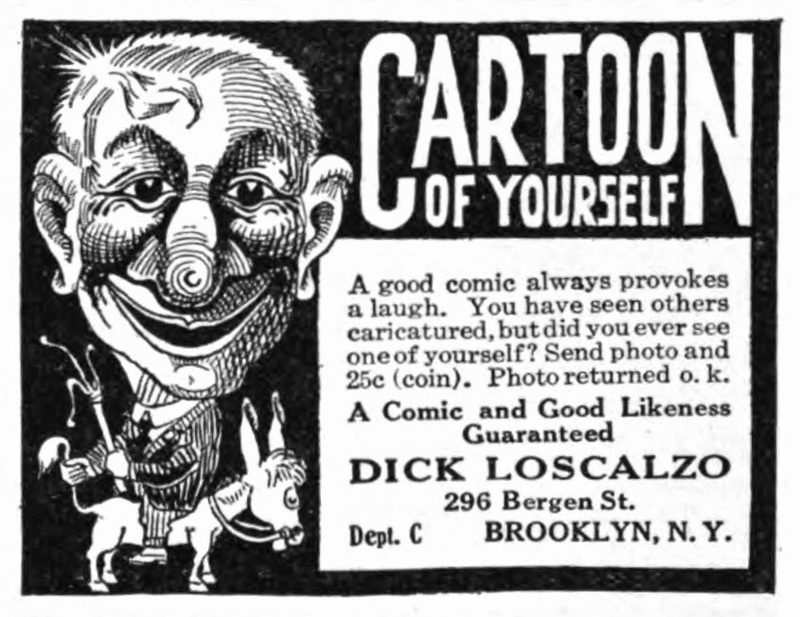 His advertisement appeared in Cartoons Magazine, April 1916. Loscalzo signed his World War I draft card on June 5, 1917. He lived at 296 Bergen Street, Brooklyn and would remain there into the 1940s. Loscalzo worked at a cartoon company located at “354 40th St. New York City”. His description was short and slender with brown eyes and dark brown hair. He was inducted March 28, 1918 and honorably discharged December 24, 1918. His early life was recounted in the Brooklyn Daily Eagle (New York), August 4, 1918. Dominick Loscalzo of Brooklyn, Now Art Director of Camp Paper. Started Life as a Bootblack. Enthusiastic Over Army Work—Surprises Friends with Skill as Boxer. Camp Upton, L. I., August 2—A self-made man has been discovered in this cantonment and he is a Brooklyn boy. He made himself known on his arrival a few weeks ago by furnishing the camp paper with a cartoon which caused considerable comment. 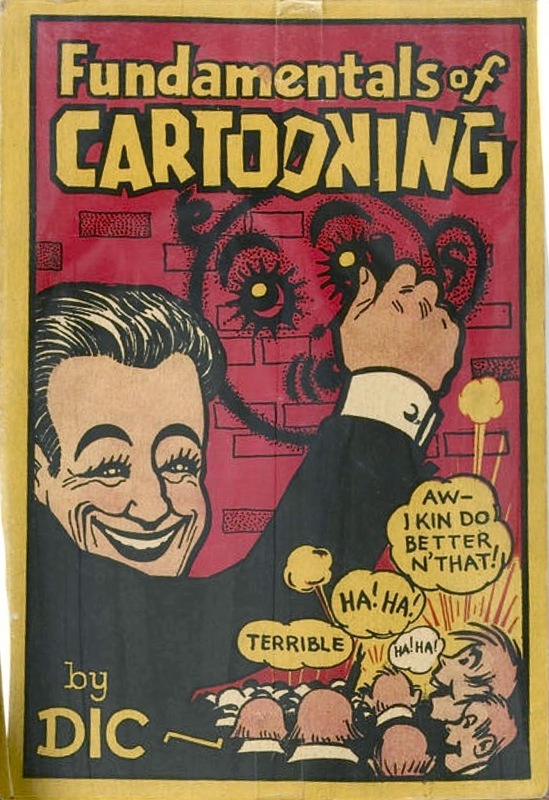 The cartoonist turned out to be Dominick Loscalzo, newspaper boy, bootblack, cartoonist, art director of the Modern Cartoon Service and now Private Loscalzo. Dominick is 24 years old, and lived with his parents at 296 Bergen street when he was drafted in June. Besides his mother and father, he has three brothers and a sister. He was born in New York City of Italian descent and received a public school education. About six years ago his parents came to Brooklyn to live and have been at the Bergen street address ever since. When Dominick was a small boy he started his business career by shining shoes in front of a Manhattan hotel. He later sold newspapers in Park. Row. He spent hours in the Public Libraries studying. Loscalzo admired cartoons and one day made up his mind that this would be his life’s work. Although Loscalzo is in the Army he is still a cartoonist. He has become associated with the camp paper, Trench and Camp, and now holds the position of art director of that paper. The young soldier has appeared on almost every vaudeville circuit in the country and his cartoons have usually made a hit. When Dominick attended Public School 19, in Manhattan he took an active part in school athletics. He has won twenty-five medals for running. Several days ago when scheduled to give an exhibition in one of the Y. M. C. A. huts, Frank Daily issued a challenge to box any man at 124 pounds. Daily was about to give up looking for anyone to fight, and the crowd seemed disappointed, when Dominick, who claims that he wanted the boys to have some fun, came strolling out on the platform and announced that he would meet young Daily for two rounds. Dominick, who is very small and weighs only about 104 pounds, was advised by his friends.to get off the stage, while others who were looking for fun, advised him to stay. He stayed, went the two rounds to the surprise of all, and gave Daily a merry time. The contest was a draw. Dominick is now spending all his spare time on art work for the camp paper and hopes to furnish the sheet with some good cartoons. When asked what he thought of soldiering, he replied it was the greatest life in the world and that if every young man in the city took the exercise given to soldiers, there would be few cases of sickness. The Board of Elections of the City of New York voter enrollments said Loscalzo was a Democrat in 1919. In the 1920 census, Loscalzo’s occupation was newspaper cartoonist. His Modern Cartoon Service was listed in the 1922 Queens Copartnership and Corporation Directory. Loscalzo advertised his service in magazines such as Film Fun, May 1922; Boys’ Life, June 1923; Popular Mechanics, August 1923; and Popular Science, September 1923. Loscalzo had an entry in the Catalogue of Copyright Entries, Part 1, Group 2, Pamphlets, etc., 1922, New Series, Volume 19, Number 2. Cartoon stunts, cover-title,  p. illus. 8vo. © Dec. 15, 1921; 2 c. awl aff. Dec. 28,1921; aff. Jan. 19, 1922; A 656110. Complete course of cartoon stunts. Brooklyn, Modern cartoon service, 1921. cover-title, 10 loose 1. illus. 4to. [Text parallel with binding] © Dec. 15, 1921; 2 c. Dec. 28, 1921; aft. Jan. 19, 1922; A 656111. © Modern cartoon service, Brooklyn. Razzberries. [Comic cartoon drawing in four sections showing boy masquerading in girls’ bathing suit and wig] © 1 c. Mar. 4, 1924 ; G 70891. Why don’t you broadcast it? [Cartoon strip drawing of man talking to small boy asleep in chair] © 1 c. June 9, 1924; G 71668. Apparently, both were not published. Later, Loscalzo adopted the name “Dic”. The Fourth Estate, December 18, 1926, reported Loscalzo’s latest work. Dic Loscalzo, of Brooklyn, N. Y., creator of On the Links, formerly of the Wheeler-Nicholson Syndicate, is the author of a new book of golf comic strips, On the Links, which has just been issued by the Associated Feature Service. The volume contains 48 large pages and an article on The Folly of Trying Too Hard, by Walter Hagen, the golf champion. A write-up of Dic’s rise from newsboy to cartoonist appears in the January issue of Cartoons Magazine. Loscalzo illustrated two children’s books by Elizabeth Lucy Gallagher: Music Rhymes (1927) and Musical Nonsense Primer for All Children Under Eighty (1928). The 1930 census said Loscalzo was a freelance artist. The Catalogue of Copyright Entries, Part 1, Group 2, Pamphlets, etc., 1931, New Series, Volume 28, Number 10, had an entry for Loscalzo’s book on cartooning. Loscalzo’s surname was misspelled in the Catalog of Copyright Entries, Part 1, Group 2, Pamphlets, Etc. 1936, New Series, Volume 33, Number 8. 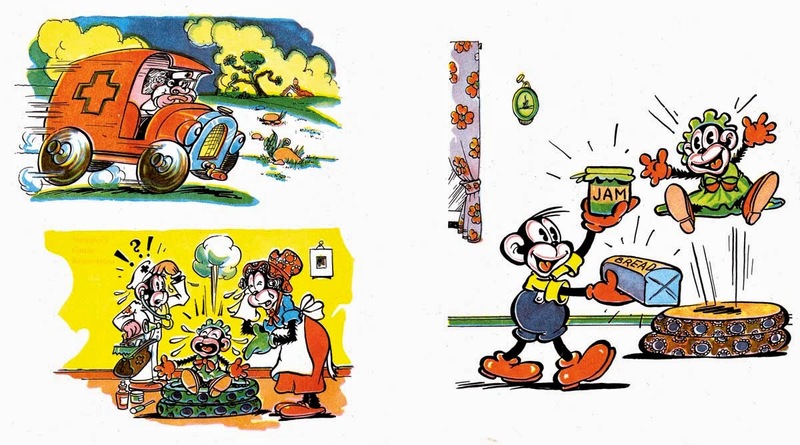 Some of the strips were credited to and signed “Dic”. Other strips had the byline “Al Boon” who, most likely, was Alex Blum, an Eisner and Iger Studio artist. Oddities of the News ran from March 19, 1937 to February 25, 1938. It’s not known when Loscalzo joined the Eisner and Iger Studio; Loscalzo’s name is not listed in the studio personnel at Who’s Who of American Comic Books. On Loscalzo’s World War II draft card, his employer was “Izner & Iger, 202 E 44th St, NYC”. Although Eisner and Iger parted ways in 1939, that was the business name Loscalzo remembered. In the 1940 census, cartoonist Loscalzo and his father were the only occupants at 296 Bergen Street in Brooklyn. In 1944 Loscalzo illustrated the children’s book, Chimpsey at Play, which was written by Ruth A. Roche, whose employer was Jerry Iger. Action Play Books was one of Iger’s publishing ventures. 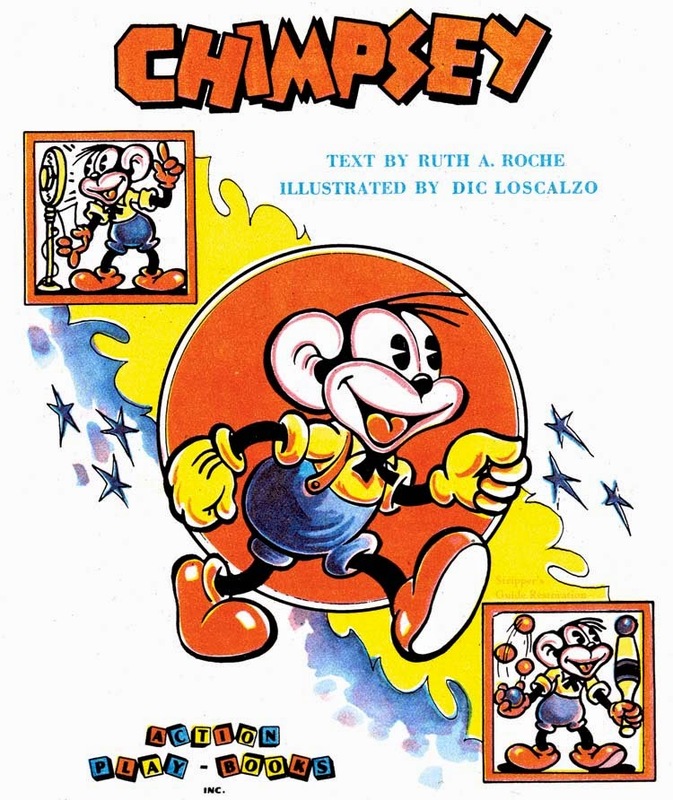 Chimpsey was published in 1945, probably after Loscalzo had passed away on January 31, 1945, in the Bronx, New York, according to the New York, New York Death Index at Ancestry.com.